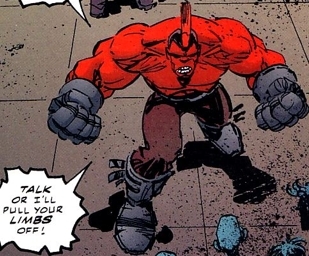 Other Distinguishing Features: Rogue Warrior has red skin and a Mohawk hairstyle. Powers: Superhuman strength and high-intensity force-beam projection from his hands. When the Special Operations Strikeforce was still relatively new, a unit was dispatched to deal with a bank robbery being performed by Rogue Warrior. This powerful freak was about to be taken into custody when Kill-Cat leapt into action to try and prove himself to the government. His interference caused Rogue Warrior to try and swat aside the vigilante and ended up killing the S.O.S. agents present without even really trying. After CyberFace took control of the planet, Rogue Warrior found himself as one of the villain’s enforcers. He went after Dragon when he arrived in Pittsburgh and ended up brushing aside the considerable might of the Atomics. Dragon eventually gave himself up to spare the Atomics execution and Rogue Warrior took part in the firing squad that seemingly killed the hero, unaware that Vanguard had teleported Dragon to safety. Rogue Warrior laters joins Dart’s faction of the Vicious Circle and helps her break out members of the Vicious Circle from Stronghold Penitentiary. Rogue Warrior is present when Dart II kills FirePower and assumes control of the Vicious Circle. He is also part of the scouting party sent to find Malcolm Dragon and is knocked out after a brief battle with Malcolm. He later helps Dart kidnap Malcolm’s kids but is beaten by Angel Murphy.